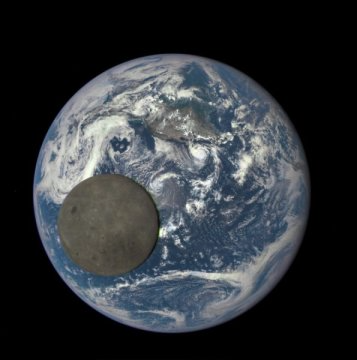 [SatNews] A NASA camera aboard the Deep Space Climate Observatory (DSCOVR) satellite captured a unique view of the moon as it moved in front of the sunlit side of Earth last month. The series of test images shows the fully illuminated "dark side" of the moon that is never visible from Earth. The images were captured by NASA's Earth Polychromatic Imaging Camera (EPIC), a four megapixel CCD camera and telescope on the DSCOVR satellite orbiting 1 million miles from Earth. 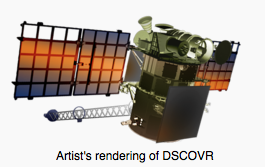 From its position between the sun and Earth, DSCOVR conducts its primary mission of real-time solar wind monitoring for the National Oceanic and Atmospheric Administration (NOAA). In May 2008 NASA's Deep Impact spacecraft captured a similar view of Earth and the moon from a distance of 31 million miles away. The series of images showed the moon passing in front of our home planet when it was only partially illuminated by the sun. EPIC's "natural color" images of Earth are generated by combining three separate monochrome exposures taken by the camera in quick succession. EPIC takes a series of 10 images using different narrowband spectral filters—from ultraviolet to near infrared—to produce a variety of science products. The red, green and blue channel images are used in these color images. 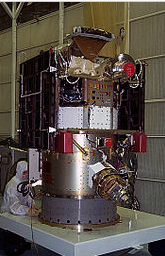 DSCOVR is a partnership between NASA, NOAA and the U.S. Air Force with the primary objective of maintaining the nation's real-time solar wind monitoring capabilities, which are critical to the accuracy and lead time of space weather alerts and forecasts from NOAA. The above information is provided by NASA/Goddard Space Flight Center.